NEW RELEASE Our Sparkling Viognier is produced in the traditional method where the wine is matured on yeast lees in bottle creating incredible complexity, and yeasty biscuity characters derived from the secondary fermentation. In its youth this wine displays refreshing citrus, stone fruit and honeysuckle characters which take on a creamy richness as the wine develops. A creamy, persistent mousse and fine bead provide a delicate mouth feel with a refreshing acid zing. Serve chilled. Crown seal. Lovely as an aperitif or with your favourite canapés, tuna sashimi or garlic prawns or fish. Tip: drop a fresh strawberry in your glass for a decadent treat at the finish. Tanya Caruana Aka: T2, TC, Ninety nine, Sporty! What she does: T2 pretty much keeps us in order, writes office procedures in her sleep and ensures anything that can move in the office has a label and a home. Why: I think the Viognier is stunning when I’m drinking it chilled with spicy takeaway noodles (the ones that come in a box), preferably on a Friday night with friends. I always have a bottle on the go in the fridge. What do you eat it with: My family’s current favorite meal request is Gnocchi Livorno – I have never online casino actually had a recipe for this I ate it once in a restaurant and created it myself! You can find the recipe in the recipes page of the blog. Andrea Graham Aka: Ang, The Stunning Redhead! What she does: Andrea does a superb job keeping in touch with our Tallisman members. She also packs up and sends your wine orders ensuring they arrive in tip top condition. Why: Alex & I just love to sit on our verandah with a bottle of the Shugg’s Folly. The paddocks we overlook change throughout the year but we enjoy the sparkling all year round. Summer is the best when the bottle has been sitting on ice. Oh the flavour is devine. What do you eat it with: A platter of anti-pasto as we watch the world go by. Have you tried it with native hibiscus flowers in the glass? That’s a treat. We devoured many of these celebrating my mother’s 70th birthday. I can’t wait to take this wine to Brazil in October to celebrate my brother’s wedding. Viognier is still a relatively new kid on the block with many people still grappling with how to pronounce it. Just to complicate the issue further, there are two accepted pronunciations. You can try "vee - on - yay" but if that isn't working for you, try "vee-on-yer" and you will more than likely get what you ask for in the bar or bottle shop. We will look at other wine variety pronunciations some other time, but for now lets focus on this complex and seductive white. Exotic ... sensual ... voluptuous ... are just a few of the words used to describe viognier. With such a reputation it's hard to believe this grape variety was nearing extinction as recently as 1986, with just 20 hectares of the grape planted in Condrieu, its place of origin in the Northern Rhone of France. Fortunately for wine enthusiasts, the increase in popularity of Rhone Valley wines during the 1990s brought this variety back into the spotlight again. While Viognier is the only grape variety permitted to be grown in the Northern Rhône appellations of Condrieu and Château-Grillet, plantings of the variety are increasing in other appellations such as the Côte-Rôtie. Viognier is also now grown in the Southern Rhone Valley, other appellations of France, and several of the new world wine regions including Australia. Unlike its outgoing personality as a finished wine, the viognier grape can be quite shy in the vineyard. Difficult to grow, and low yielding the most challenging quality of viognier is the tiny window of opportunity the variety offers to be picked at optimum maturity. Top quality viognier relies on the skills and experience of the winemaker to ensure maximum flavour development is not achieved at the expense of excessive sugar or diminished acidity. While viognier is still considered a relatively new variety in Australia, its popularity is on the rise. As a table wine, viognier presents as a rich, luscious, textural wine with an array of flavour and aroma compounds including stone fruits, particularly apricot, honeysuckle, orange blossom, grapefruit, muskiness, fruit pastille, spicy and exotic characters. Viognier is sometimes described as oily so acidity is essential to balance the medium to full bodied palate weight. Full or partial barrel fermentation, malo-lactic fermentation and barrel lees stirring are just some of the winemaking techniques used. In Australia, viognier is increasingly blended with shiraz as the marriage of these varieties enhances the qualities of shiraz. This blend originated in Côte-Rôtie in the Northern Rhone Valleywhere shiraz and a small parcel of viognier are co-fermented. In Côte-Rôtie the percentage of viognier may be as high as 20% but in Australia it is usually between 3 and 7%. The inclusion of viognier in the blend adds vibrancy to the colour of the shiraz, adds floral notes to the aroma and creates a silky textural quality to the wine. Such is the enhancement that viognier offers to the shiraz that this particular blend is currently one of the most popular in Australia. On a much smaller scale, viognier has been used to produce a sparkling wine with quite incredible results. 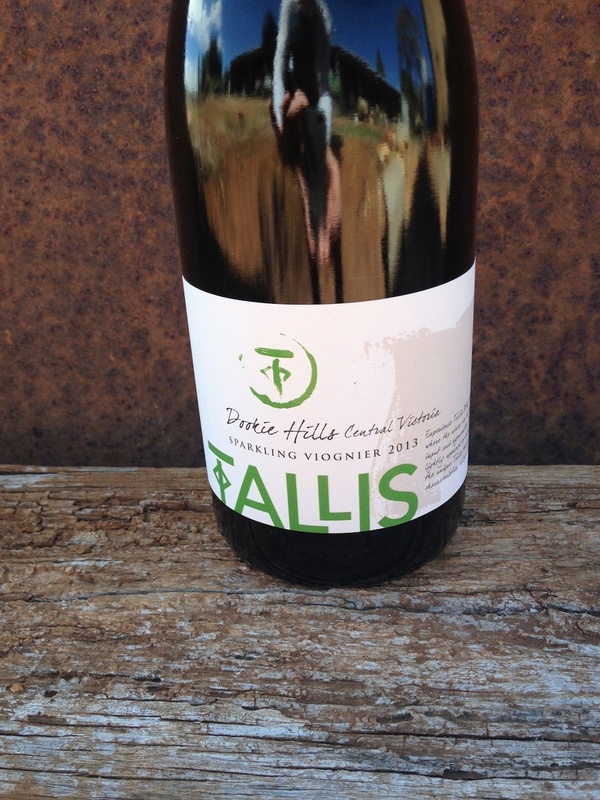 Tallis Wine may in fact be the first Australian winery to produce and release such a wine. In our trials with viognier as a sparkling base we discovered that less than 12 months on bottle lees produced a wine retaining many of the varietal aromas and flavours of typical of viognier however additional time led to yeasty toasty characters dominating, with undertones of stone fruit and spice. With a preference for the complexity given by additional time on lees we have chosen to use the traditional method of sparkling wine production for our viognier. Our current release Traditional Method Sparkling Viognier 2007 displays these very characters.